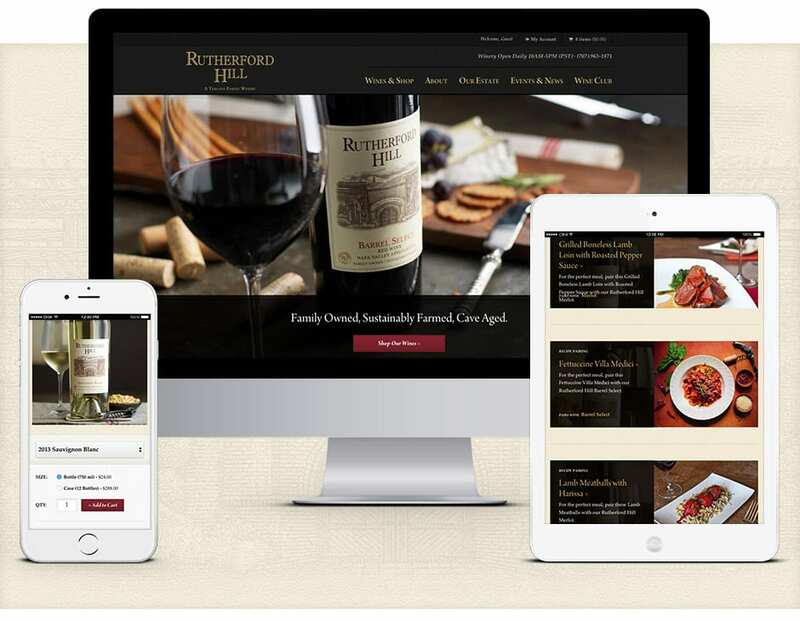 The Rutherford Hill website serves up a perfect pairing of design and functionality for wine enthusiasts and foodies alike. 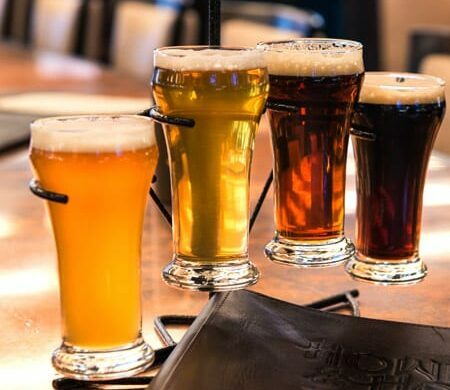 Orbit Media created and custom product catalog and shopping cart integration platform that made it easy to find and buy everything from their flagship Merlot to the other estate-grown varietals. The Family Recipes are another way to explore Rutherford Hill’s portfolio of world-class wines. 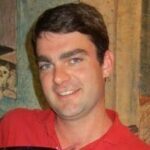 This site promotes the brand will improving the flow toward conversion. 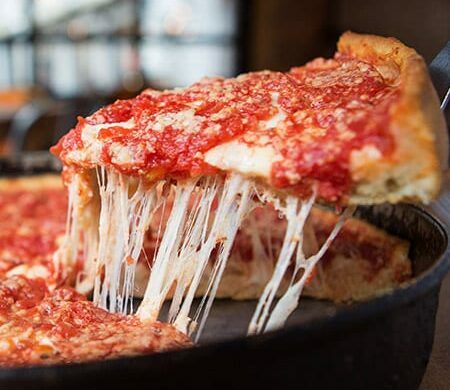 The Malbec is the recommended pairing for the BBQ Duck Pizza while, for something lighter, the Chardonnay pairs well with Lobster Risotto. 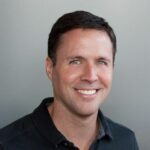 There are also events, a custom blog design, and a custom shipping calculator, creating a complete customer experience. Tap to fill your shopping cart with the varietals you love. 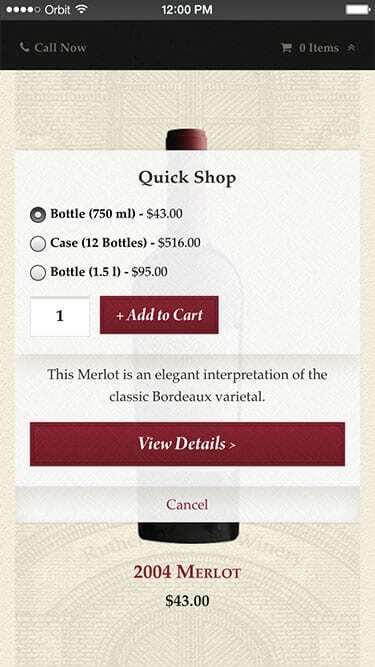 Wine shop optimized for mobile viewing with large product images. 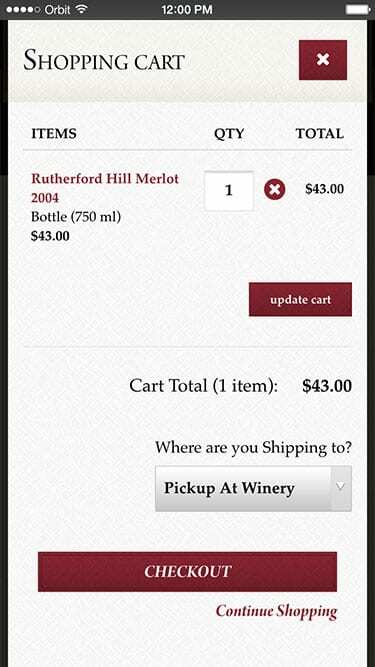 Add wine to cart with easy one-tap “Quick Shop” feature. 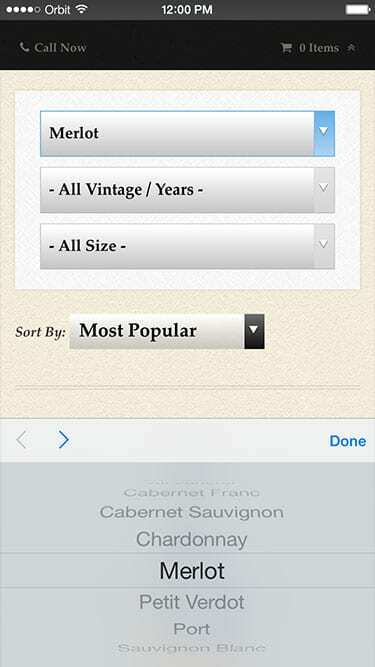 Filter by varietal, year, or size to simplify browsing. 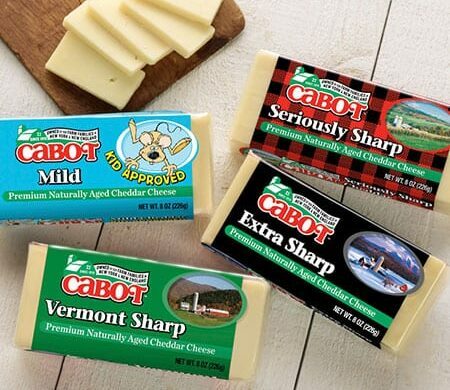 Get a taste of the Napa Valley experience wherever you go. Whether you visit the winery or the website, you’ll get the luxury brand experience. Warm and inviting images featuring the winery welcome the discerning wine connoisseur to Rutherford Hills. 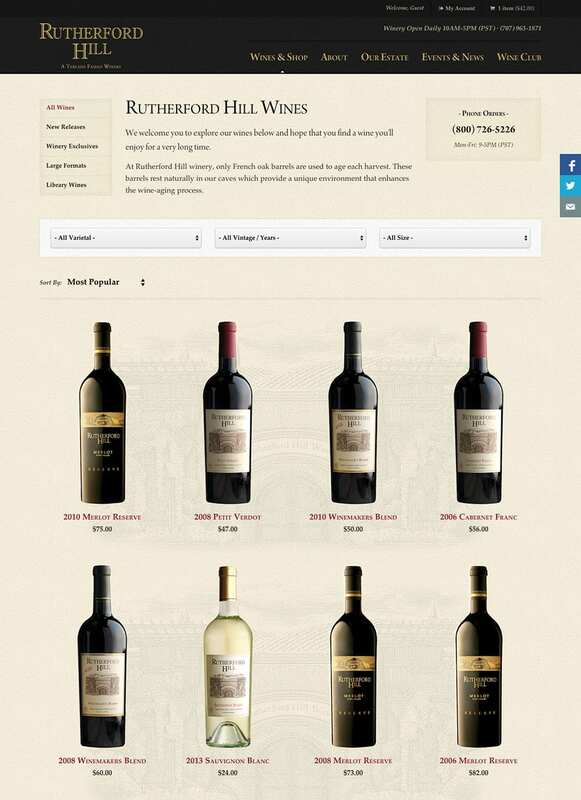 The home page ushers the visitor to the store where they can browse wines. 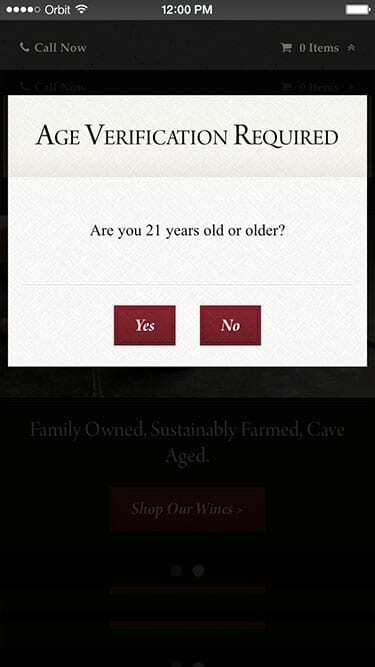 Scrolling down introduces the visitor to the brand with clear calls to learn about the wines and the wine club. 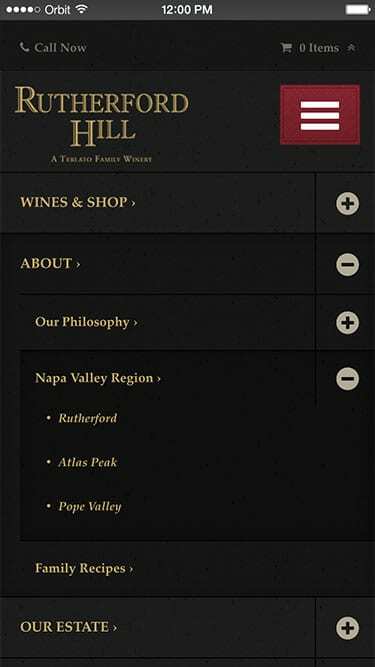 On tablet and mobile the “hamburger” menu expands with more options to explore the estate and to meet the family and winemaker. Compact and mobile-friendly without compromising the stunning photography, the website offers the functionality of an online store while delivering the Rutherford Hill brand experience.